Before the invention of microprocessors computers were used to be in the size of a room but minicomputers were considered as small that fit into a desk. Italian machinery Olivetti Programma 101 was the first programmable calculator or computer came to the market in 1965. Later in 1971 more computer were introduced in the market by Hewlett-Packard, Apple and IBM. 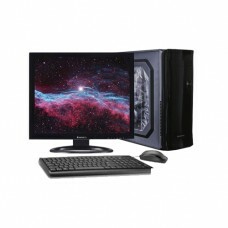 A budget PC is specially designed personal computer comprising all the basic components such as motherboard, processor, RAM, storage, casing & monitor at lowest price available in the market but functioning at optimum level. Other peripherals like mouse & keyboard completes these configurations. Desktop experts develop these machines consisting full workability, in few cases gaming in normal mode, considering the budget constrain of the clients. These desktop computers have perfect compatibility for home use. Desktop setup for business in low budget you can rely on these cheap PCs. Star Tech has the variety from low price to the mid-range PC built for the market of Dhaka, Chattagram Rangpur, Khulna & Sylhet. You can enjoy the best price by purchasing online from anywhere in Bangladesh. Order online and have the delivery at your desired location.